The Lamoille Basin includes the Upper, Lower and North Branches of the Lamoille River, Lee River, Browns River, and the shoreline areas from Malletts Bay to Hog Island. Watershed and river groups in this basin include the Lamoille County Natural Resources Conservation District & Watershed Initiative, Lamoille River Watershed Commission, Morristown Conservation Commission, St. Albans Bay Area Watershed Association, Friends of Green River Reservoir, The Greensboro Association. Want to learn more about the Lamoille River Watershed? Our Fall 2013 Watershed Educators have researched each sub-basin in the Lake Champlain Watershed to create a power point presentations as a resource for you. We've made each presentation available here, on our watershed pages, so that you can present it to classroom, show it at an informal talk, or use it to learn more yourself! 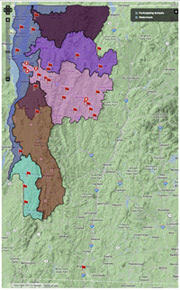 Click here to view the Lamoille River Watershed presentation.